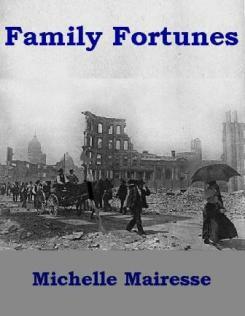 Family Fortunes, by Michelle Mairesse, is a tour de force of masterfully plotted mishaps reminiscent of the works of Galsworthy, Wharton, Dreiser and other highly acclaimed English and American early twentieth century novelists. Episodic and sublimely irreverent, the novel’s lavish descriptions and careful attention to details create the perfect backdrop for presenting the life and times of a landed gentry rapidly going to seed. In order to survive, they must pay obeisance to a nouveau riche plutocracy. The setting is San Francisco in the summer of 1905. Center stage are families Huckfeldt, Allister, and de la Tour, with their disparate social and economic fortunes. While scrambling to improve their lot, they race to the finish line to determine which of the siblings lands the best legacy. With professional marriage broker Carolyn Daintridge in charge of predetermining the winner, nothing should go wrong, but of course everything does. Included in the mix of unforeseen calamities are the deliberate exposure of a clandestine affair; an accidental pregnancy; the 1906 San Francisco earthquake followed by a devastating fire; birth of an illegitimate child; dysfunctional marriage and divorce leading to yet another round of illicit liasons. Through it all, the train of life, with its excess baggage of grief, regret, heartbreak and remorse somehow keeps chugging along toward its nameless destiny. Weathering every storm with remarkable courage is heroine Jenny Allister, who ultimately achieves happiness and true love by demonstrating to the reader that only with patience, self-possession, and self-reliance can one be deserving enough to win the lottery. Moral of the story: Once the playing field is leveled, life takes on a different perspective, the past is forgotten as if it had never been, and social mores are merely a matter of perception. Mairesse is a polished writer who leads readers into the drawing room and entices them to stay by offering them an intricate plot, well wrought characters and choice morsels of dialogue dipped in subtle humor. With this book, she finds her place among the great American novelists. Family Fortunes has all the right ingredients for a feature film or long-running television series. 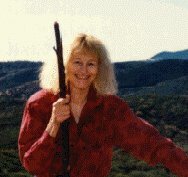 Michelle Mairesse is a freelance writer who has published a book on botanical medicine, a newspaper column and articles on art, literature, politics, linguistics, and the environment.